I’ve been told over and over that I eat like a rabbit. I like to snack on small things and if you visit me in lab you’ll often see a bowl of nuts, fruits, trailmix, etc on my desk. I think I get this habit from my dad; he rarely eats full meals especially lunch. Though this snack is not Murrali (my dad) approved since he is allergic to chickpeas. 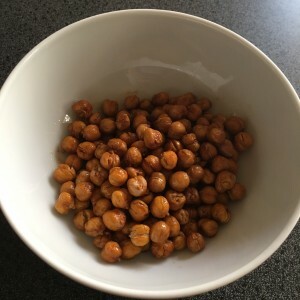 The combination of roasted chickpeas with soy, honey, and sriracha make this snack delicious and totally addicting. Enjoy! 2. Thoroughly drain and rinse the canned chickpeas and arrange on a baking sheet. Make sure the chickpeas are as dry as possible and spray lightly with olive oil cooking spray. 3. Bake for 20 minutes, tossing gently every 5 minutes. 4. Whisk honey, soy sauce, and sriracha together. Toss hot chickpeas in this sauce and serve!